We are happy to be offering math students the use of ALEXS , by which we can see better their strengths and areas of growth, and I can shape the math curriculum to suit the actual needs of our students. We have a world class science lab for our middle school students (over in the high school), better than I have seen at most other schools and even colleges. For the first time this year we’ve added a comprehensive health curriculum to our MS PE curriculum: Sun exposure safety, sleep needs, nutrition, anatomy, substance abuse. We’ve also added, in addition to the traditional team sports, individual and life-long sports to the curriculum, including Judo, Yoga, and Bicycling. We use technology widely in world language instruction to advance our students’ proficiency: we are using voicethread and video technology so they can see and hear themselves speak Spanish. We are offering Spanish now also to parents and other adults in evening classes. In Latin class we are studying what is the basis of Western Civ– the mythology of the ancient world, beginning with thorough studies of the Trojan wars. We study especially tales and models of leadership, because of our school’s commitment to develop leadership in our students. In the middle school we are working to integrate studies across the curriculum, such as studying Latin at the same time as Roman History in Social Studies and reading/acting Julius Caesar in English class. We take your children and turn them into classicists– not just students of the classics. Our goals of the English department are to instill strong reading and critical thinking skills and strong written and oral communication skills. Beginning in 7th grade all students will read at least one Shakespeare play every year. We read texts in 6th grades as if we are reading detectives, trying to solve a crime by identifying the clues in key passages and assembling them into an explanation. We use essential questions to guide our English curriculum, such as in the 8th grade where our year-long question is What Does it Mean to be an American? 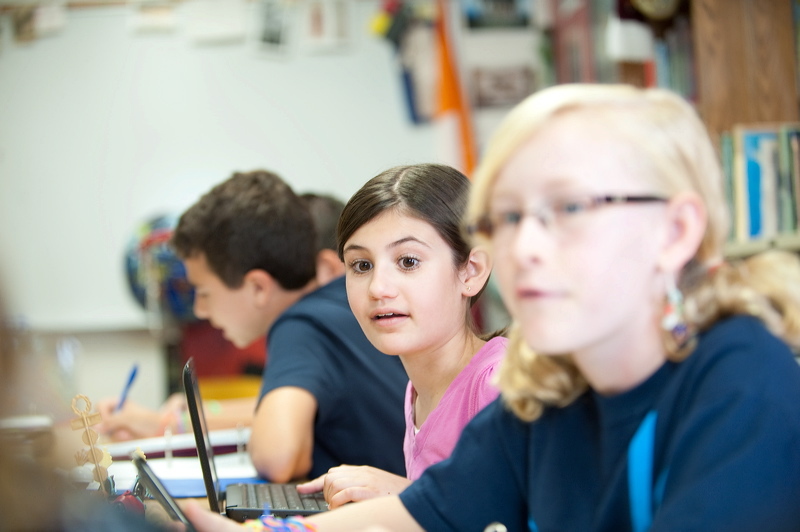 To learn grammar in 6th grade we have students work in groups teaching each other the key topics, and we provide the students an array of electronic resources such as youtube videos to employ to develop their lessons to teach other students. This is the best school I’ve ever been to. I used to be a guest teacher and visited 100s of schools, and I am really happy I landed here. This is the best school on Earth, I believe. I will never say as an Art teacher: Class, we are going to make a cow now and everyone has to make a cow in this way. Instead, I demonstrate skills and model their use, and they I say to you to make things that are authentic to you as art, that comes from your core, and I will be your coach to help you make the things you want to make.